A family grocery chain that came to Mississauga as an outdoor market some 45 years ago has grown to 25 stores across the province. The family-owned Longo’s chain is in expansion mode, having more than doubled its number of stores in the GTA since 2000. The new 48,000-sq.-ft. Leaside store opens today, bringing the number of Longo’s stores in Ontario to 25. CEO Anthony Longo’s father opened the first store on Yonge. St. in Toronto in 1956. The family lived upstairs. The Longos moved their base of operations to an open-air market at the four corners in Malton in 1967. Longo’s opened its first real supermarket at Goreway Dr. and Derry Rd. in 1980. It closed in September 2008 but the chain still has three stores in Mississauga, where it was based for many years. In all, 14 family members work full-time in the business. “As a family, we set out to decide, how far do we want to grow? We decided we’ll stop when we can’t execute great stores anymore. I don’t know when that is,” said Longo. Longo said the competition in the grocery market is “very fierce.” Despite that, there is room for growth, he said. In the GTA, groceries is a $13-billion a year business. Cheap chic retailer H&M is launching its housewares collection in the U.S. in early 2013. The collection, which is already available in Europe, will include moderately priced linens, cushions and other accessories for the home based on “themes seen on the runways,” according to Women’s Wear Daily. The home collection debuted in 2009 in Sweden, Great Britain, Austria and Germany. Much like the quick turnaround of its apparel business, where a top can go from design table to store rack in a matter of weeks, H&M will introduce a number of new home items every two weeks. –Target Corp. is continuing its collaborations with local retailers by teaming up with four new partners to produce limited-time apparel and home collections for the fall. Called the Shops at Target, these partnerships bring on small boutiques that design items to be sold exclusively at the discount retailer. Debuting Sept. 9, Target will unveil products from the minds behind New York’s Kirna Zabete and Odin stores, Francisco’s the Curiosity Shoppe and Boston’s PATCH NYC. Products will include apparel, bedding, kitchenware and home accessories. –Discount giant Wal-Mart Stores Inc. announced plans for a grocery-centric Neighborhood Market in Downey. The nearly 33,000-square-foot grocery store, which is sliding into a space formerly occupied by a party supply shop, will open later this year. It continues the retailer’s aggressive expansion into the Southland supermarket business. Wal-Mart’s plans have been welcomed in some communities and spurred fierce opposition in others. A planned grocery store in downtown Los Angeles’s Chinatown neighborhood has sparked multiple protests. Downey City Council member Mario Guerra said in a statement that he is pleased to see Wal-Mart “breathing new life” into an empty retail spot. China’s retail market is growing exponentially. Accounting for roughly 14 percent of the economy, how retailing progresses is gravely important to the entire economy, and to China’s growth prospects. It is equally important to China’s trading partners. No economy can reach fully-developed status, including a robust consumption-based economy, without a fully-developed, modern retail and distribution system. The innovation and productivity of the retailing sector affect the manufacturing, agriculture and services sectors more powerfully than does any other industry, save perhaps banking. Four important trends have dominated Chinese retailing over the past dozen years. The first is a massive and highly successful influx of sophisticated foreign retailers creating extreme competition. By 2005, more than 35 of the world’s top 50 were in China. Some, such as Ikea, are moving cautiously. But most are racing. Carrefour forecasts 25 new hypermarkets annually and Tesco 10 a year for the foreseeable future. Wal-Mart’s billion-dollar investment in Trust-Mart (35 percent stake) and purchase into Yihaodian – one of China’s leading e-commerce websites – demonstrates its intentions. Management consultant A.T. Kearney predicts double-digit retail growth for the foreseeable future. Domestic players still dominate. Gome Electrical, for instance, China’s leader in household appliances expanded stores by 20 percent, increasingly in smaller cities. Major international retailers are also expanding rapidly, aiming at smaller cities. Metro Group has plans for 100 total outlets by 2015. With 900 million Chinese yet to move into the ranks of the middle class, China will be a magnet for global retail giants for years to come. The second trend is the substantial competition-induced efficiency gains. Successful technology applications to reduce costs and improve performance are critical where competition leaves paper-thin margins. Some are simple: new lighting, heating and ventilation technologies to reduce energy costs. Others are more fundamental: regional distribution hubs, computer-based stocking, and cold chains critical to modern food retailing. Food and product safety regulations, and middle-class preferences, require more modern distribution technology. It also makes higher-end Chinese goods more attractive in US and Europe when they more closely meet the destination standards. Recent studies find that international retailers in China focus primarily on brand image. Chinese firms focus more intently on information and communication technology capability. More than just online sales, this means focusing on computer-based business process efficiencies.Research at the MIT Sloan School of Management finds that every dollar of real estate, plant or ordinary equipment a company owns in the US, on average returns one more dollar of market value. Better computer-enabled business or organizational practices, however, add about $10, a total of $2 trillion in the US. ICT-based business process improvement is serious business. As firms push to reach the large cities of the western interior – what some call the last great industrial adventure – highly efficient logistics structures and processes are critical. These form the backbone of inventory management. World-class management practices in the large retail sector will have profound value-added effects for China; and inevitable productivity spillover into other sectors. Increasingly sophisticated local retailers make China a tough market for foreign companies. China Resource Vanguard in Shenzhen and Yonghui in Fujian province, for instance, use local knowledge and savvy management teams to grow rapidly despite the entry of Wal-Mart and Carrefour. Wahaha and Tingyi have grabbed market space from Coca-Cola and Pepsi. Detergent producers Nice Group and Guangzhou Liby Enterprise Group have captured about 35 percent of the detergent market, and Haier, the No 4 refrigerator producer in the world, is dominating its market. The fruits of this competition include aggressive pricing and customer service, more unconditional refunds, nicer shopping environments, more attention to quality and locality preferences of consumers, and product/service flexibility that have improved the overall consumer experience. The third is the rise of a coherent regulatory structure. Over the last several years, important regulations on the retail sector have been issued, including new labor laws, strict food safety and quality standards, and environmental protection rules. Since the Sanlu milk powder scandal in 2008, central and local governments have begun to pay much more attention to food safety and quality control. In response, firms have expanded quality control efforts over their own products and those in their supply chains. Retailers increasingly require suppliers to pass formal certification of food safety and quality improvement systems (such as QS and ISO 9001). Standardized international marketing strategies on quality, value and service have helped Chinese retailers build a stronger brand image. Consumers, who often pay extra for foreign brands to get the quality and safety assurance, can increasingly find that comfort with Chinese brands. These brands will become more attractive to foreign markets as well. Partly as result of new labor laws and a stronger regulatory environment, wage increases of up to 40 percent, more stringent compliance requirements (particularly in the areas of food security and sustainable development), and higher taxes have led to significantly higher costs. These costs are part of a modern, world-class retail sector. The fourth is the shift to online retailing, or e-commerce. China is expected to have 700 million Internet users by 2015 – as many as in the US, India, Japan, Russia, and Indonesia combined. Last year, Chinese consumers spent 1.9 billion hours online. Seniors and rural residents are new to the Internet but are rapidly becoming active cyber-citizens. What are they doing? Increasingly it’s shopping. Shopping is the fourth-most-popular online activity in China, and the fastest growing – 36 percent of Chinese Internet users shop, and this is expected to soon reach 50 percent. The Boston Consulting Group reports that China has 193 million online shoppers – more than the US, and five times that of the UK. 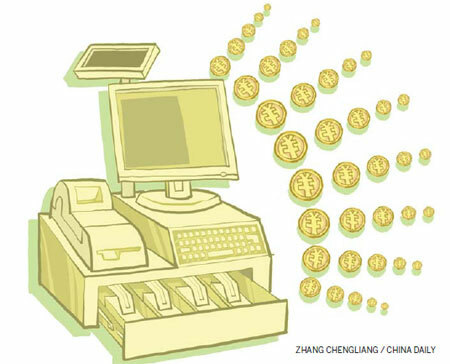 By 2015, China’s e-commerce sales should match the US, and could capture 8 percent of total Chinese retail sales. Simply put, companies cannot have a major presence in China without being online, not just to sell, but also to engage with customers where they spend so much of their time. If they are not buying, they are researching. A quarter of consumers research online before purchasing. Another 29 percent research and buy online. Taobao’s C2C site, for example, offers more than 500 million products by more than 5 million merchants, with 50,000 sales per minute. Unlike eBay, most products sold online in China are new. Major retailers are moving online, such as Wal-Mart via Yihaodian, Gome through Coo8.com. Chinese companies appear to be more aggressive than their foreign rivals in embracing Internet channels. As foreign firms focus on brand loyalty, surveys suggest Chinese firms see ICT as the primary tool to win consumers, especially the important 20-40 year olds. More than 40 percent of foreign competitors had no plans to focus on online sales while 93 percent of Chinese firms already are, or soon plan to be, online. Despite an overwhelming preference for in-store shopping, consumers are being turned off to high street retail by low customer service levels, new research released today reveals. In a survey conducted by customer intelligence company Market Force, electrical retailers had the lowest customer service satisfaction score of any service industry with just 2.24 per cent of shoppers left happy. Clothing retailers scored only 2.69 per cent, supermarkets polled 6.10 per cent, local convenience stores received 6.48 per cent backing from consumers, while department stores got the highest score of any retail business type with 9.72 per cent left satisfied. Of those surveyed 41 per cent said that their biggest frustration with store staff is a lack of interest in their needs and wants, and despite more than three quarter of people preferring bricks and mortar shopping to online as a many as 88 per cent will leave a shop if service is poor. Tim Ogle, CEO at Market Force Europe, commented: “Good customer service doesn’t have to be expensive. Small, inexpensive changes can have an oversize impact on whether someone buys in your shop and how much they spend. Retailers are increasingly realising that in order to make their bricks and mortar offer as compelling as their online platforms they have to improve the experience of visiting their stores. This morning the UK’s largest retailer Tesco announced a huge recruitment drive, which in part is in reaction to a perceived drop in the supermarket chain’s service levels in recent years. Several simple service techniques could be employed by businesses to boost trading it seems, with Market Force also finding that 59 per cent of shoppers like products to be recommended to them by staff members. Although shoppers like to have a personal service, they also seem open to new technologies which cut out staff interaction, with 63 per cent saying they like to use self-service machine and 49 per cent in favour of contactless payments. In a warning to retailers keen to make more transactions automated however, the research shows that 37 per cent of consumers feel they should pay less when using self-service checkouts. Compared to other industries retail appears to be struggling to please its consumers at present, with banks (10.8 per cent), restaurants/pubs (28.3 per cent), and hotels (31.5 per cent) all scoring higher customer satisfaction levels in the Market Force survey. Bigger is not always better. Just ask the biggest retailers in the country — and their customers. Neng Yang, left, purchases a new phone at the Best Buy Mobile mini-store at Independence, Mo., with her brothers Cheng Yang and John Yang, right. KANSAS CITY, Mo. — To Neng Yang, the Best Buy store in Independence, Mo., is just too overwhelming — so much so that she only shops there once a year, at the holidays. So when she needed a new cellphone, she bypassed the 55,000-square-foot store with its many departments — appliances, big-screen TVs, computers, cameras, car audio, video and music. Instead, she stopped across the street at the Best Buy Mobile store. The slimmed-down 850-square-foot sister store concentrates only on mobile devices. “I ask about a thousand questions, and this is more personalized, more one-on-one attention,” said Yang of Blue Springs, Mo. Yang bought a white Droid Razr, and her brother John Yang picked up a black one. The recession and the growth of online shopping have conspired to cut chains down to size. One strategy they’ve employed has been to close underperforming stores. But Best Buy and an increasing number of companies are trying another strategy too — going smaller. Among the retailers testing smaller concepts are Blockbuster, Ann Taylor, Gap, Kohl’s, Lowe’s and Sports Authority. RadioShack even is trying a “store-within-a-store” format in several OfficeMax stores in California. Lower square footage makes for lower construction and remodeling costs, and that also tends to make them easier to finance. The smaller locations have less overhead costs and can be manned by fewer employees. The small size also gives the chains more flexibility in locations, allowing them to squeeze into heavily developed urban centers, and compact spaces in airports, college campuses and strip centers. If the location isn’t successful, the chains can close the sites with less financial fallout. “For a decade it was ‘build it and they will come,’ ” said Candace Corlett, president of WSL Strategic Retail in New York. “It’s definitely a correction for retailers as well as restaurants, a direct result of consumers not having as much to spend on the extras. The strategy has to be to reduce your costs to offset less traffic. Usually that means less rent, shrinking retail and restaurants,” Corlett said. Jeff Green, president of Jeff Green Partners, Phoenix-based real-estate consultants, has long criticized the “bigger is better” movement. “They think the bigger they are the more exciting they are and that’s not necessarily the case, as Apple has proven,” Green said. When retailers like Ann Taylor, Chico’s and the Gap opened larger stores, they didn’t necessarily see an equivalent rise in sales, if any rise at all, that would justify the added expense, Green said. One of the latest retailers to embrace small stores is Cabela’s. On Feb. 16, the outdoor-equipment and sporting-goods retailer said it would open its first Cabela’s Outpost Store this fall in Union Gap, just south of Yakima; up to three more are planned for next year. The Outpost stores will be significantly smaller than traditional Cabela’s: about 40,000 square feet compared with, say, the 185,000-square-foot Cabela’s in Lacey, Thurston County. Cabela’s also has plans to open an 110,000-square-foot store this year at Quil Ceda Village on the Tulalip Tribes Indian reservation. And it will target smaller markets — 250,000 people or less with a high concentration of them already Cabela’s customers. Best Buy introduced its mobile locations in 2007 and there are about 260 nationwide, including the Independence Best Buy Mobile store, which opened in August. Best Buy has about 1,100 full-size stores. “The customer wants a different shopping experience. We don’t work on commission, and we carry everybody,” said Kyle Cochran, manager of the Independence store, which is tucked between two specialty stores on the lower level of the Independence Center mall. Still, consumers who have come to know a brand as a “category killer” might be confused by the new concept. The Wal-Mart Neighborhood Stores are designed to provide shoppers with a quick, convenient stop for fresh produce, dairy items, and pharmacy products at low prices. The grocery stores are about 29,000 square feet compared with a 142,000-square-foot supercenter. But some grocery store shoppers still expect to see the large selections of products Wal-Mart is known for. Carolyn Shaw of Shawnee, Kan., was disappointed in the holiday selection at a Wal-Mart Neighborhood store earlier this month during a morning stop in a snowstorm. Johannesburg, Dec 9 (I-Net Bridge) – In a deal that will pump US$13 million into the Zimbabwean economy, SA’s second-largest grocer Pick n Pay (PIK) on Friday said the final government hurdle had been cleared for it to up its holdings in TM Supermarkets from 25% to 49%. The TM Chain is controlled by Meikles Limited and is the largest chain of retail stores in Zimbabwe by number of stores, with 51 outlets. “Yesterday the shareholders of TM Supermarkets voted unanimously to allow Pick n Pay to purchase the additional 24% of shares,” Pick n Pay said. In November, the Competition and Tariff Commission of Zimbabwe declared that it had examined the competitive effects of the merger on the Zimbabwean market and established that the transaction did not reduce competition or create a monopoly situation, but rather strengthened the ailing TM Supermarkets. The commission then agreed to Pick n Pay taking its shareholding of TM Supermarkets to 49% subject to certain conditions pertaining to labour and local procurement of goods. “The acquisition of the additional shareholding in TM Stores has been a protracted one that has stretched over more than three years, and required the approval of the Zimbabwean Investment Authority, the Zimbabwean Reserve Bank, the Zimbabwean National Indigenisation and Economic Empowerment Board, and now finally the approval of the Competition and Tariff Commission of Zimbabwe,” Nick Badminton, Chief Executive Officer of Pick n Pay said. Dallas Langman, head of group enterprises (Africa) at Pick n Pay said it was important to note that not a cent of the money coming into the TM Stores business would go towards shareholder dividends. “All the money is earmarked for developing and strengthening TM stores in Zimbabwe. Some seven stores will be rebranded with the Pick n Pay brand, but we wish to express our confidence in the TM brand and respect its history in Zimbabwe,” he stressed. “The investment will see money being spent on local procurement processes and will give employment to Zimbabweans during the refurbishment of stores and the staffing of them,” Langman added.